Oil-free air/water chiller for outdoor installation. Suitable for air-conditioning and the production of hot water for large-sized services in residential, commercial and industrial buildings. TBX is a single-circuit chiller charged with R134a gas. 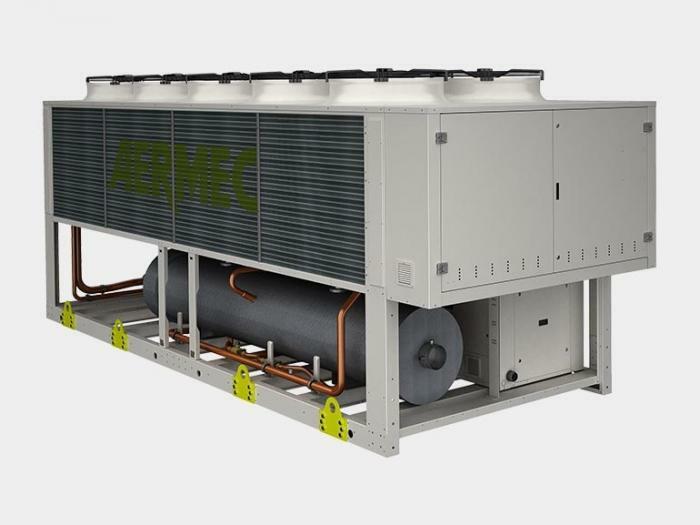 It has axial fans to ensure the quietest possible machine operation, the latest oil-free centrifugal compressor with magnetic levitation, a tube bundle heat exchanger (flooded type) and finned pack copper/aluminium coils. Centrifugal compressor with two-stage compression and variable speed aluminium impellers, designed to work without lubrication oil. It has radial and axial magnetic bearings to allow the levitation of the rotary shaft and therefore the elimination of contact between the mechanical parts. TBX is ideal for medium/large-sized services in residential, commercial and industrial contexts. There are 3 versions - standard, low noise and high efficiency.